FIDE Grand Prix participants after the second round battles were talking to the journalists on their impressions of the games. Evgeny Alekseev: Approaching the first control, I had a certain blackout. For some reason I decided that we are playing with an increment! When I had just 8 seconds left on the clock, I suddenly realized that there is no increment, so I had to speed up! I had some minor problems to solve, and ended up losing on time in an equal position. It has never happened to me before, and I hope it will never happen in future. Peter Leko: My position was slightly better throughout the game, but the opponent defended very well. In the end I was also in time trouble and had to play very fast not because I tried to flag Evgeny, but because I was worried about making the time control myself! Vassily Ivanchuk: Everything went logically from the start. The first critical moment occurred after 21...b6. I had a decent and natural move 22.b4 – White advances the pawn to b5, occupies the c6-square, and so on. However, I decided that I should play in a more concrete style. Unfortunately, after 22. Ra3 c5 I didn’t find anything decisive. I underestimated 24.. ab6, and Black returns a piece, but obtains a very solid position in return. Since I didn’t find any advantage for White, I decided to force a draw. Generally I don’t think I played well in this game. 22. Ra3, for example, is a bad move. Question: You came to the press-conference with a book. Is this a chess book? Vassily Ivanchuk: No. A man approached me before the game and presented Antoine de Saint-Exupéry’s ‘Citadelle’. It is not the most famous of his books, so I’ll gladly read it when I have time. 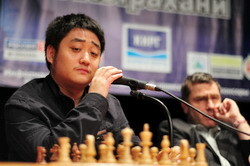 Wang Yue: I think Vassily’s play can be improved at some occasions. I didn’t like my position after 20.Be3 – the king is in danger, and there is no clear game plan, so 22...с5 was a good escape route for me. Peter Svidler: We played the Berlin Variation of the Ruy Lopez. I selected a safe line that I studied at home. The key moment of the game is White’s 22nd move. I had to choose a place for my knight: e2 or g2. I spent about 10 minutes and moved the knight to e2, and I have no idea why I made this choice – it was obvious that the knight belongs to g2. However, losing the game in two moves afterwards was not at all necessary. Maybe it just wasn’t my day. 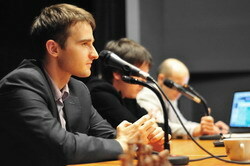 Ruslan Ponomariov: Natural flow of the game was disturbed by my opponent’s blunder. Of course it is a pleasure to win a game, but winning in some other way feels much better. Teimour Radjabov: I played this ending many times as White. My position is slightly better, and I can create various problems for the opponent. Today’s game ended in a draw rather quickly, however, if I played 20.Kf2 instead of 20. Кd2, I’d have a big advantage. I am very unhappy that I didn’t even consider this move! I can’t say I was immediately winning after it, but I could get real chances. Ernesto Inarkiev: I also play this line for many years, and already used it against Teimour, too. So this was a principled opening duel, and I think my position after the opening was little bit too good! I couldn’t see the slightest problem for Black, and it made me careless. 17...Ng6 is just a blunder – this move loses a pawn! Teimour developed the initiative and forced me to defend with accurate moves. I agree with my opponent – 20.Кf2 gives White decent winning chances, although Black’s position remains solid. 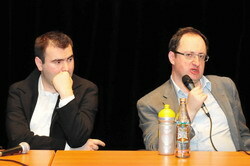 Boris Gelfand: This was an interesting game. I had no advantage after the opening, so I traded the queens and tried to play as solid as possible. Shakhriyar made a very unorthodox decision – he brought his rook to а6 and started attacking my pawns. I also replied in a non-standard way – sacrificed a pawn and blocked Black’s pieces. The resulting position was dynamically balanced, I think. However, Shakhriyar made a mistake on the move 26, playing 26...Na5 instead of 26...Nс5. Black’s position immediately became bad. White had a risk-free advantage with a strong knight against a bad bishop. Shakhriyar Mamedyarov: I thought I have winning chances, and took too much risk. With 26...Na5 I attempted to take advantage of the opponent’s time trouble and his reluctance to force a draw. Unfortunately, I underestimated all the options White had at the critical moment of the game.